Damn this girl has had one rough week recovering from being ill on the weekend, I still feel rubbish but hey ho I decided to cheer myself up and have a Lush bath to help me relax. 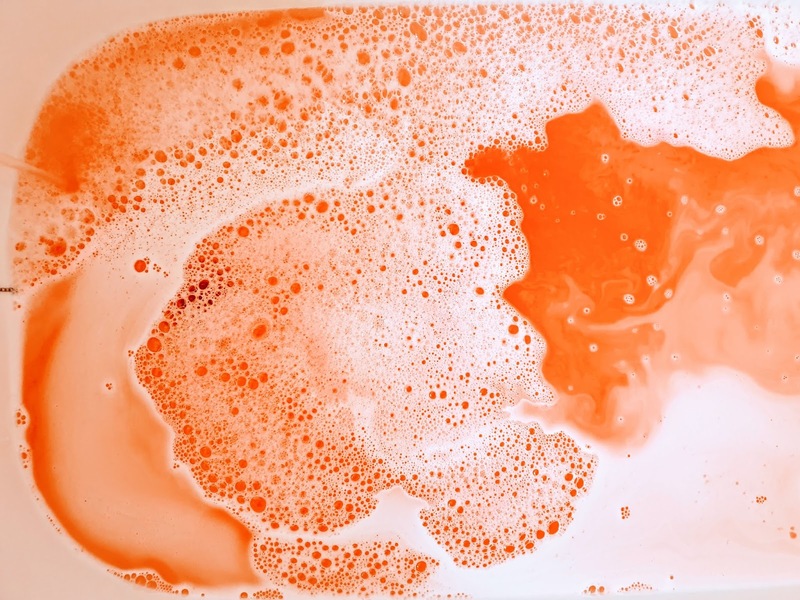 I decided to go for Peachy ( from the Lush Valentines day collection) as it's been sitting my bath bomb basket for a while now ( Plus I want to make room for more lush easter products lol). It looks cheeky don't you think? I just love the peach emoji design, its fab! It not only has a great peach design but its a good size too and has the design on both sides which is nice to see. Now since its a peach, I am not surprised by the key ingredients in this at all. The key ingredients are as follows; 'Fresh Peach Juice' 'Grapefruit Oil' 'Davana Oil' and 'Elemi Oil'. Since this is a huge bath bomb I decided to lower it into the bath slowly to see the full effect of it and my goodness I am so glad I did. 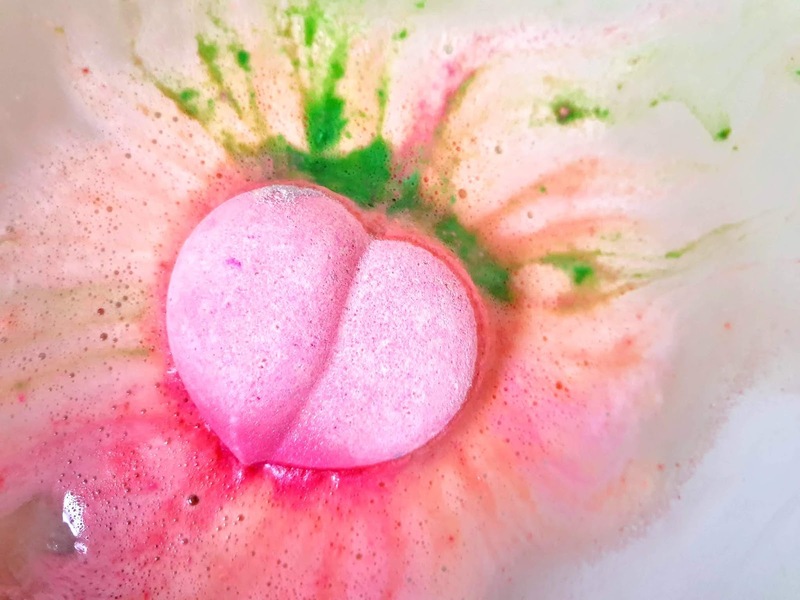 It gently started fizzing away and it had stunning bath art when it started to melt exposing a stunning variety of colour including; pink, peach and green. 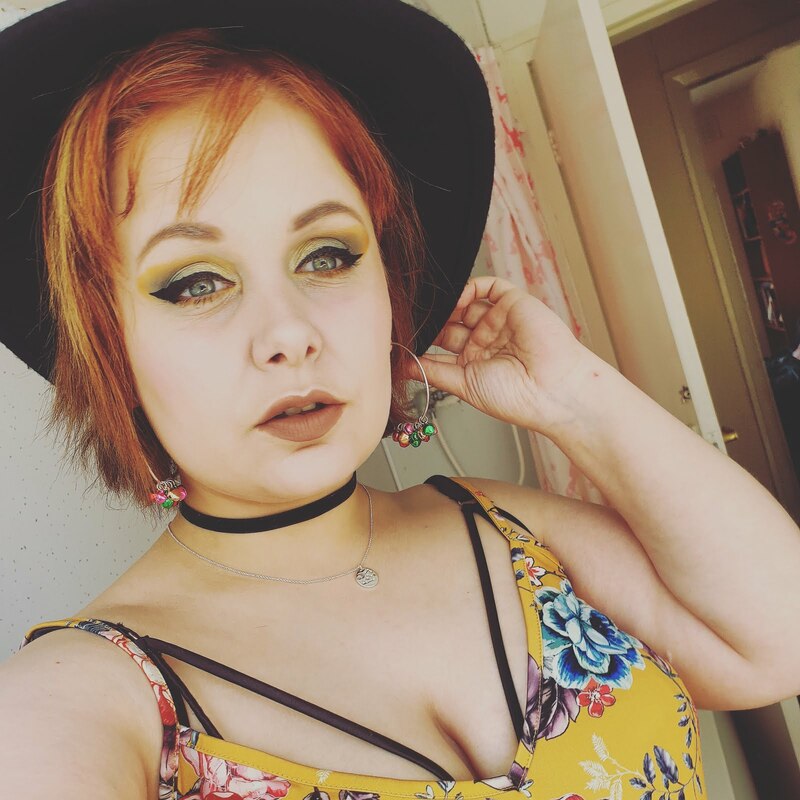 It went a beautiful vibrant coral like shade once it completed melted which looks beautiful as it also has sparkles inside it too. Unfortunately for me, that's where the compliments for this funky looking bath bomb ends. The smell for me is just not right and I really don't think the combination of smells goes nicely together, it doesn't smell fresh, smells rather like a rather chalky fake peach sweet. Now I know everyone opinion is different but for me, it wasn't up there with my favourites. The bath water did feel nice so it wasn't all that bad. It helped moisturise my skin ready for my body moisturiser after my bath. 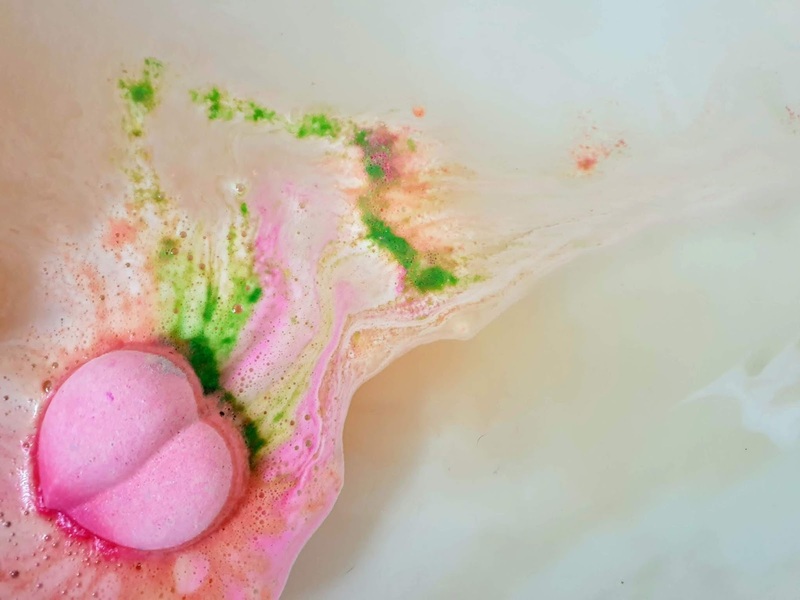 As much as I loved the bath art with this bath bomb, the fragrance just wasn't for me at all, unfortunately. 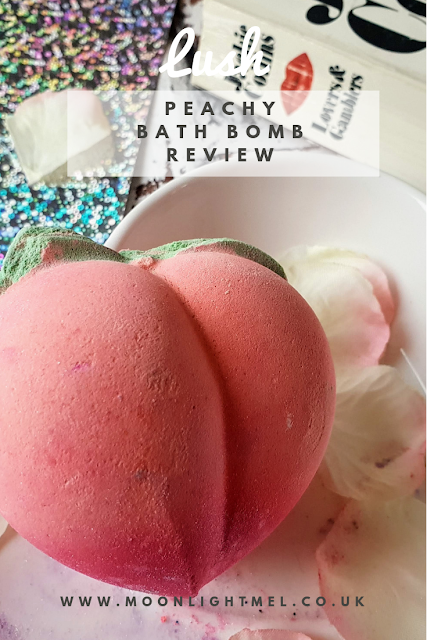 I won't be rushing back to lush to repurchase this that for sure unless the change the formula then maybe. On the price point, I do think its worth it as it costs £3.95 and it is a HUGE bath bomb and the design is pretty fun. Now even though it is not my favourite I am sure a lot of people will like this. 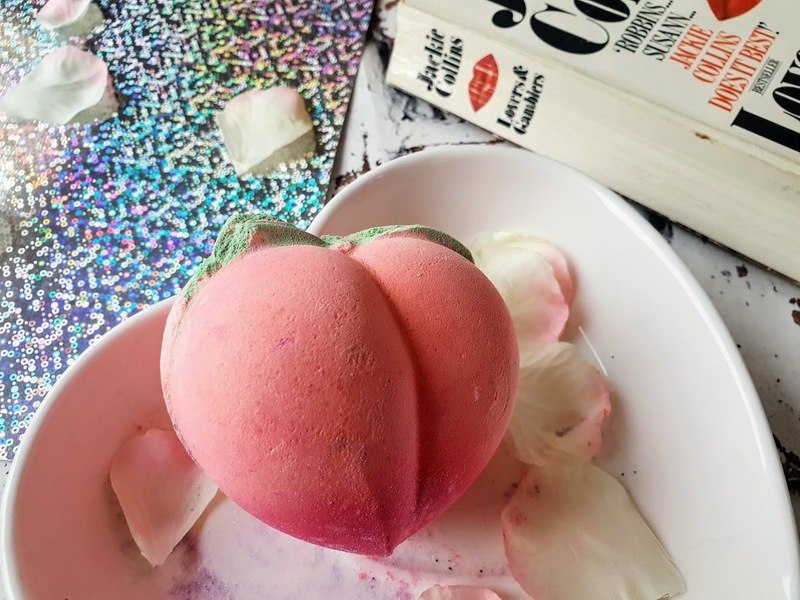 Have you tried anything from Lush yet?